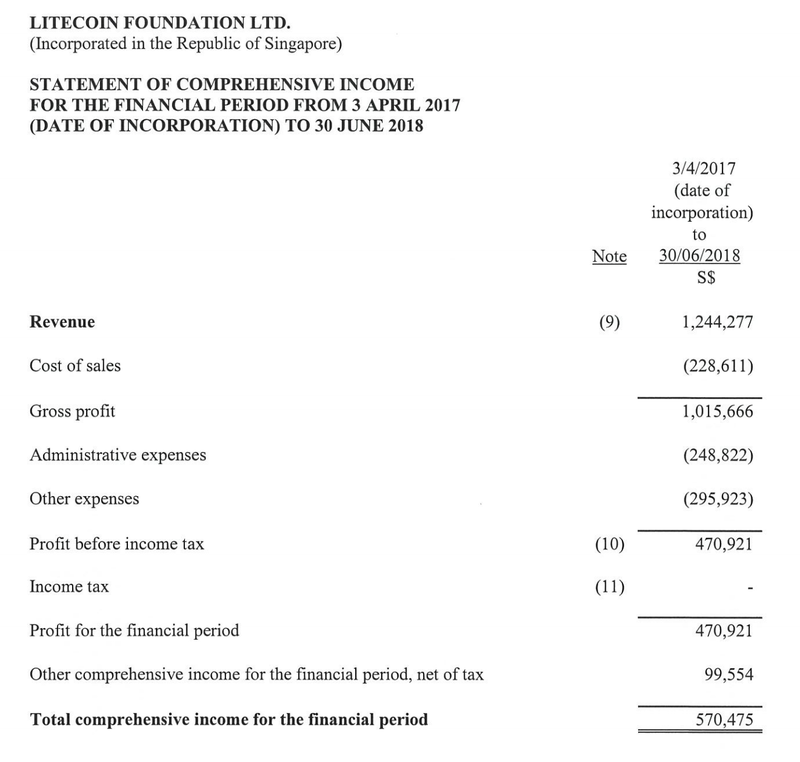 The Litecoin team have been doing really well in the past two years. First, they launched SegWit before Bitcoin. Later they founded the Litecoin Foundation and managed to run it smoothly with no seed fund. After that, they did numerous activities to promote the adoption of Litecoin, kept the Litecoin Core software up to date, and held a very successful Litecoin summit in September of this year, which was the first Litecoin conference eight years after its launch in 2011. Now thanks to the foundation's high transparency, we can easily download its audited financial report on their website. The report was released on Dec 3, which contains mainly the following financial position and income statements. We can see that by June 30, 2018, the foundation had about 620K Singapore dollars worth of assets, which is about 451K US dollars at the current rate of 1.37 SGD = 1 USD. By raising donations and selling merchandises on the foundation's online store, they managed to create $1.2 million revenue. Their expenses were small. 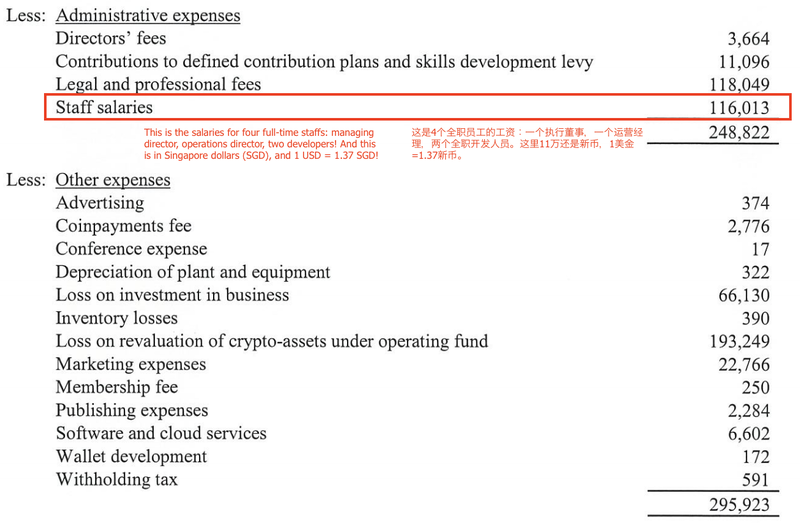 About $228K was sales cost, $248K staff salaries and legal fees, and $295K other expenses including mostly the depreciation of Litecoin values, marketing expenses, cloud services costs. 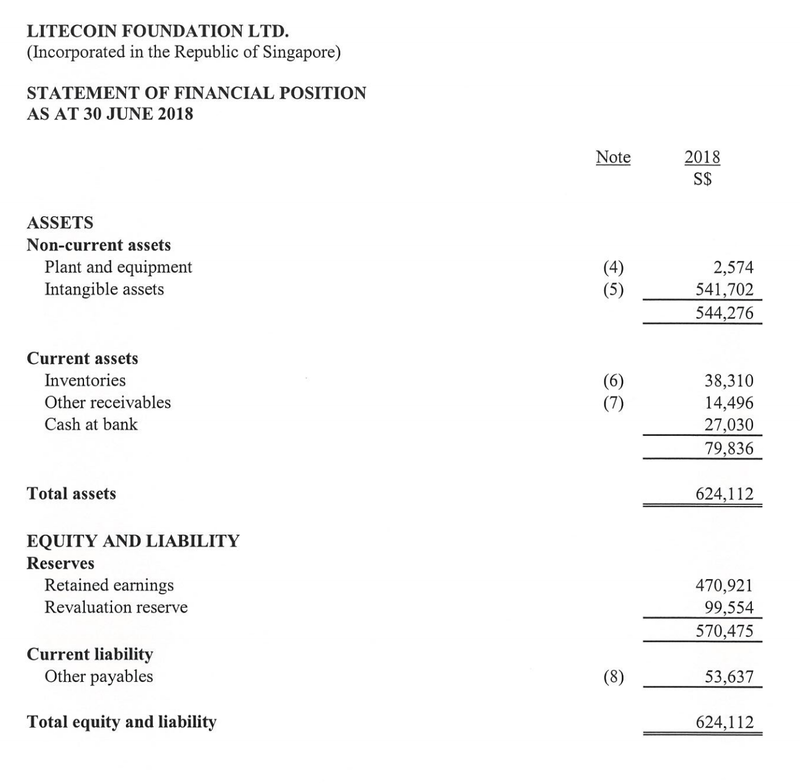 Given that there are dozens of people working in the team including four full-time staffs: the managing director, the operations director and two full-time developers (https://litecoin-foundation.org/about-us/), they spent only $116K on their salaries. Also, their board directors took only $3K director fees in total, and now they are talking no fee at all. While in Silicon Valley, one full-time developer can cost more than US$150K, the Litecoin team must be the most frugal team in the whole crypto world, and they have achieve so much in the past one and half a year! They are really believers of cryptocurrencies and they are changing the world.